Merry Christmas Eve Eve, friends! Today has been super busy. I ran errands the majority of the day and finished wrapping up most of the gifts. Kev and I just returned home from a wonderful family Christmas dinner. I think it's safe to say - this elf is exhausted. 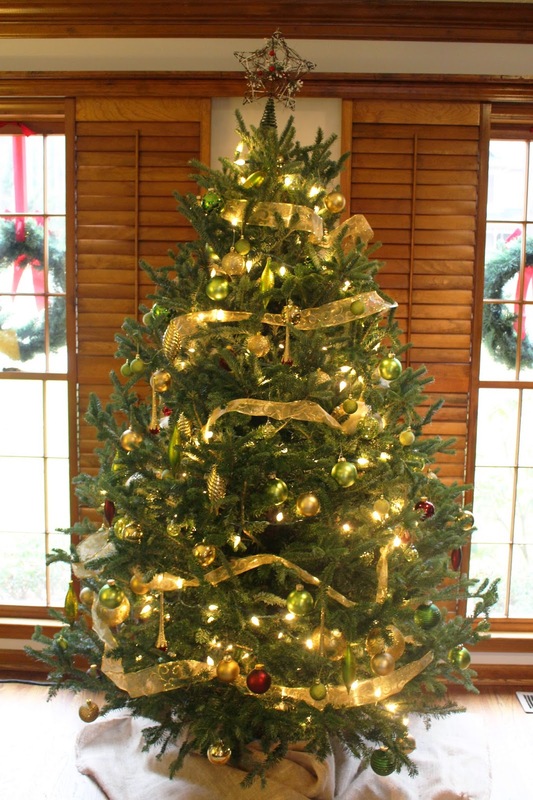 Currently, I'm sitting on the couch... soaking in some of the last days of the twinkling lights of the Christmas tree. I'm going to be super depressed when I have to put all of this Christmas Cheer away. 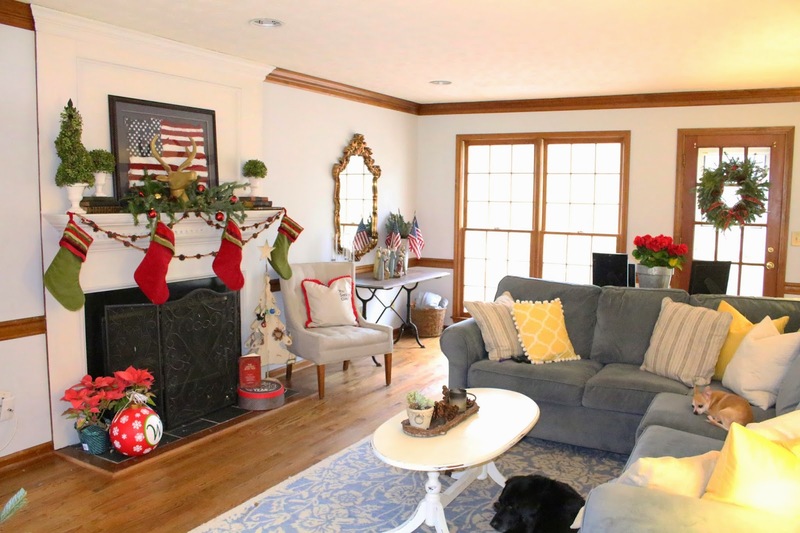 But today, the stockings are still hung by the chimney with care - so I will share our den with you. You can read A Stoneywood Christmas Part 1 here. You can read A Stoneywood Christmas Part 2 here. Our tree makes me really happy. It's simple... just gold, green and a little bit of red. UPDATE:There are now presents under this tree. My hands are still sore from the wrapping session earlier. 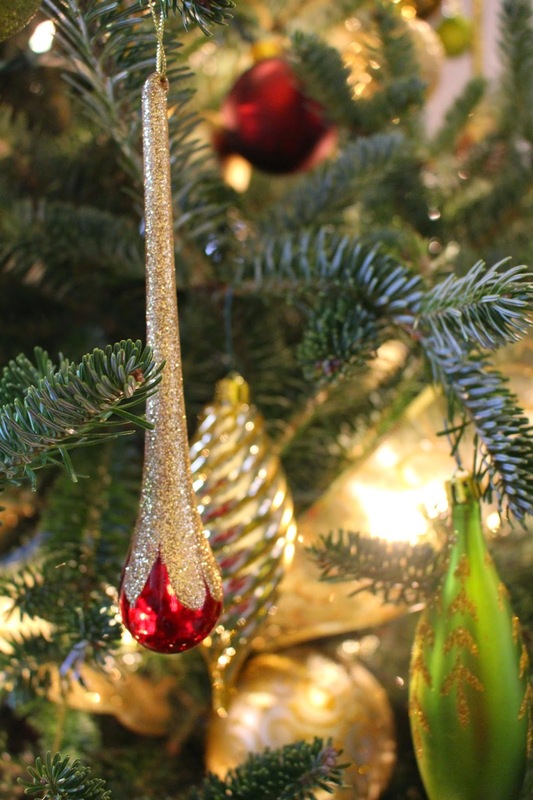 These red and gold tear drop ornaments are my very favorites. 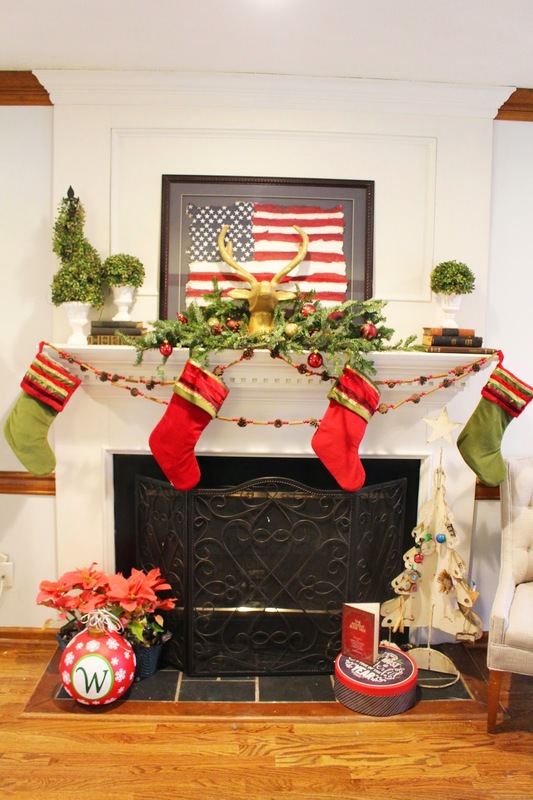 The mantle was kind of thrown together... 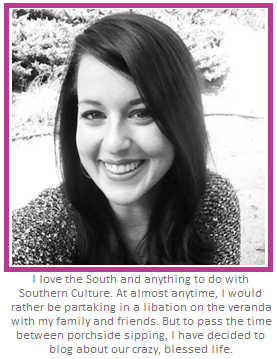 But I love the hodgepodge-ness of it. 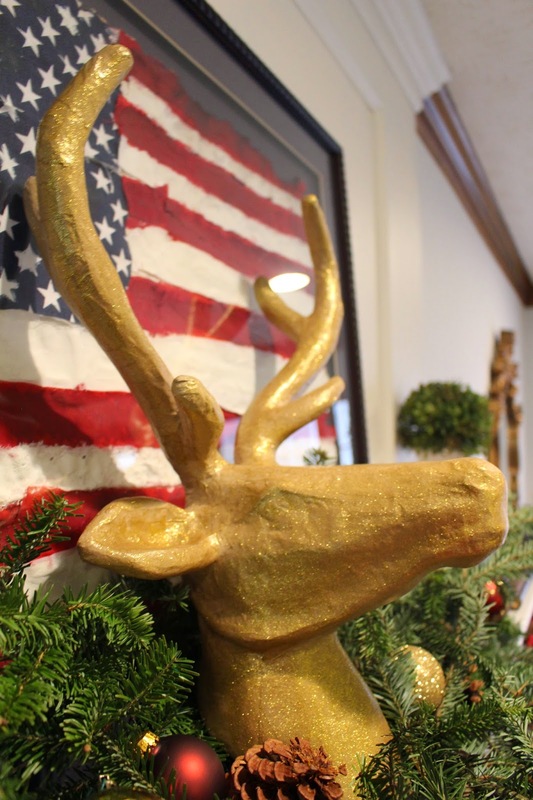 A couple weeks ago, I found a paper mache deer head at Hobby Lobby. Of course, I decided to paint it with gold glitter. Pikes Nursery (where we got our tree) allowed me to take home lots of tree trimmings. I used those, along with some pine cones and ornaments, as the foundation for the deer head. Full disclosure: I tried to make new stockings. That was a big ole' fat FAIL. I'll try again before next year. Hopefully my sewing skills will be greater at that point. I also found the garland at Hobby Lobby. I love mini pine cones mixed with cinnamon sticks and berries. I want to buy so many more of these - but HobLob was sold out. 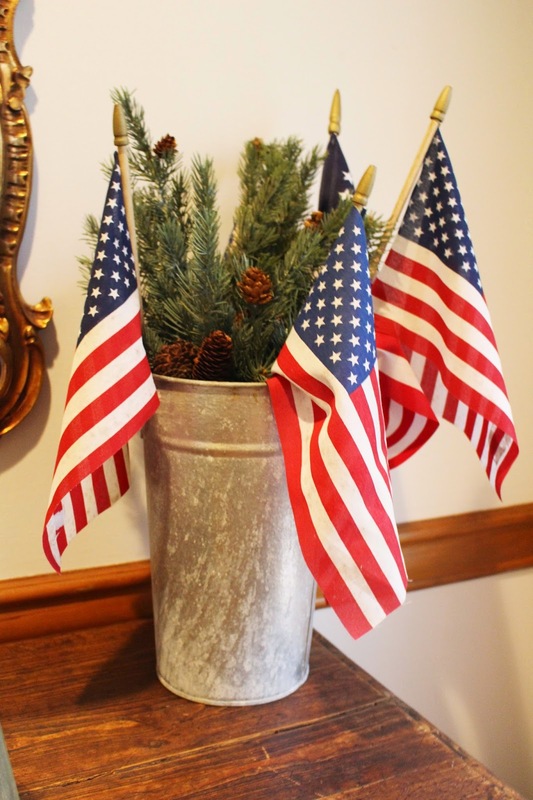 I added some greens to my 'Merica galvanized bucket. 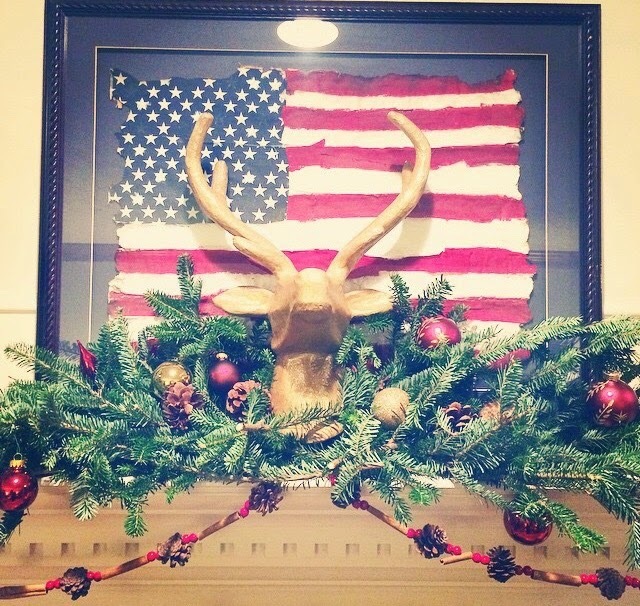 I seriously love the way it came together... especially with the mantle. It's an All American Christmas at the Wigleys. Did you expect anything differently from us? This nativity scene is a new addition. 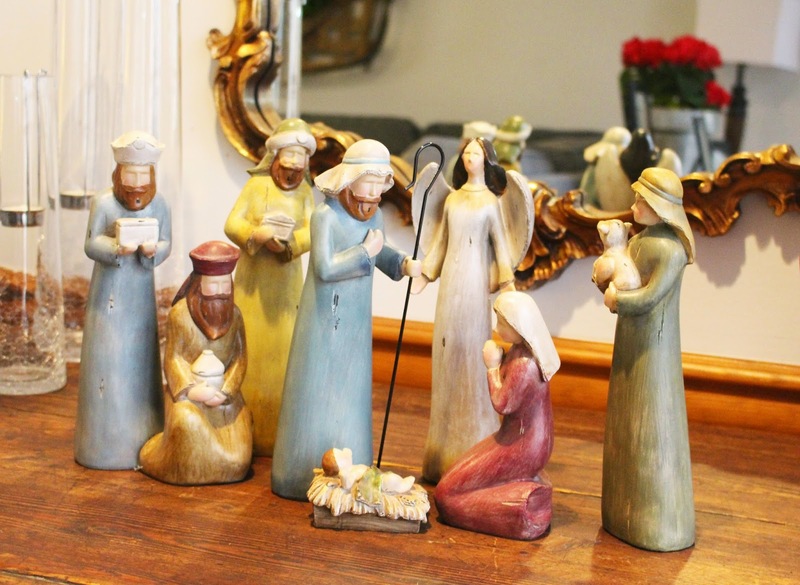 I've always wanted one to serve as a reminder that Christmas isn't about the gifts, the parties, the decorations... but rather about Our Savior being born. When we bought the tree from Pikes, they were running a Christmas package special... 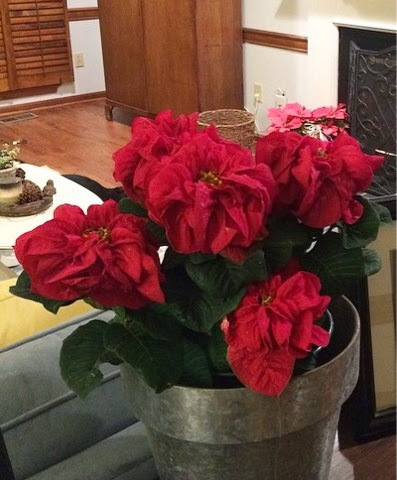 So we got this fresh wreath and the most beautiful (and unique) poinsettias I've ever seen. I added the ribbon. I'm mad for plaid right now. 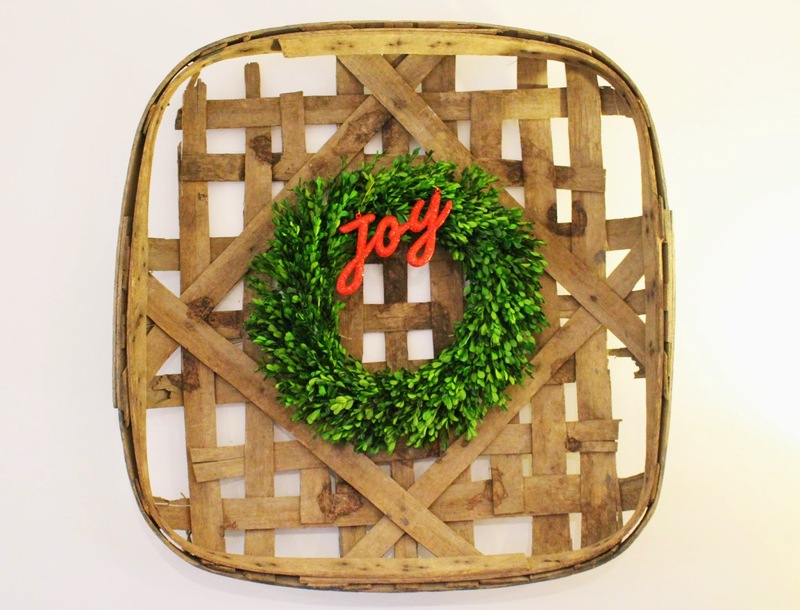 My tobacco basket and boxwood wreath also got a little "joy." 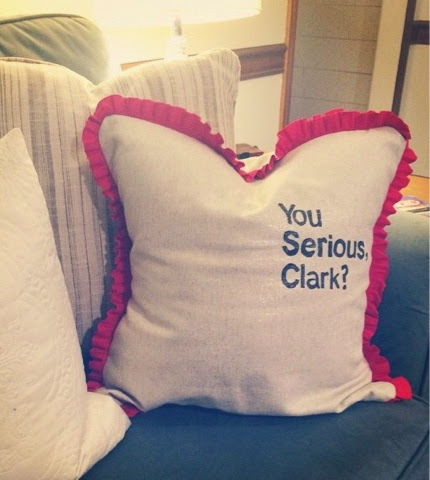 If you follow me on Instagram, you've probably seen my "You Serious Clark?" pillow. This was my favorite Christmas craft this year. It makes me giggle every time I see it. Here's a view of the full room. Notice the little photo bombers. Hubs and I have been joking that it looks like Christmas has exploded over here. I guess I was a tad excited to deck our new halls. I just couldn't help myself. 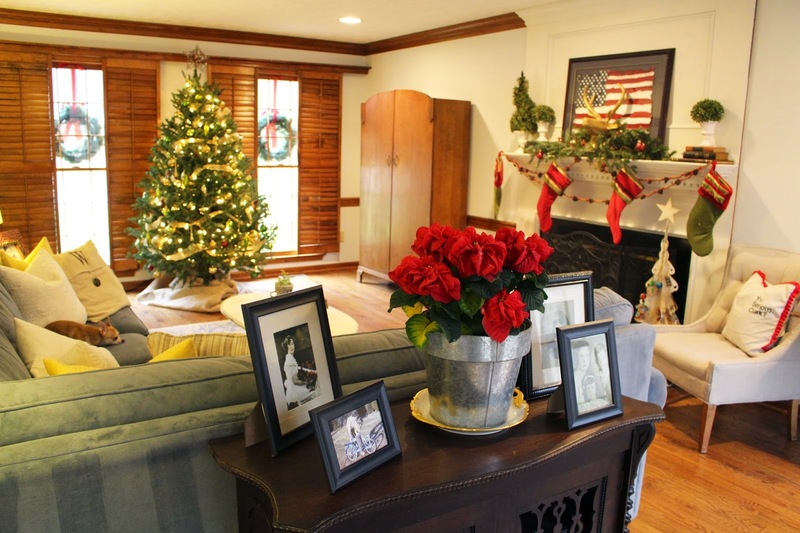 What's your favorite decoration in your home this year? 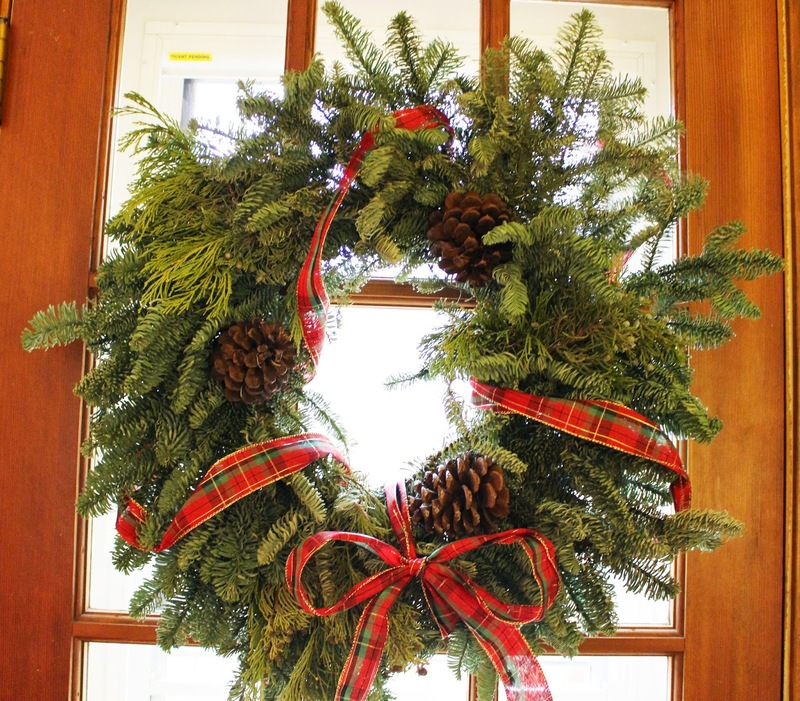 Did you complete any Christmas crafts? I hope you are having a great week and getting some special time with family and friends. Talk soon, friends!